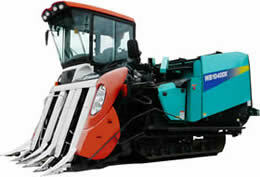 Chopping Whole Crop Harvester | Takakita Co., Ltd. Perfect for use as fermented TMR feed! Roll-bale simplified mass measuring device jointly developed with Kubota Corporation is standard equipment. At harvest time it is possible to measure roll bale mass in the field and it can be used for yield control for each field. We expanded the width of the disc cutter to shred feed rice to 1100 mm, improved the processing capacity, and made it possible to harvest up to 150 cm in height, similar to long culm types. It is equipped with a standard control box that allows you to set the number of turns of the net, display by an electronic counter that records the number of bale moldings, and a machine error message as standard, so you can easily operate and check in the driver's seat. Additive equipment compatible with spraying of lactobacillus etc. is standard equipment. The tank capacity has been increased from the conventional 20L to 50L. 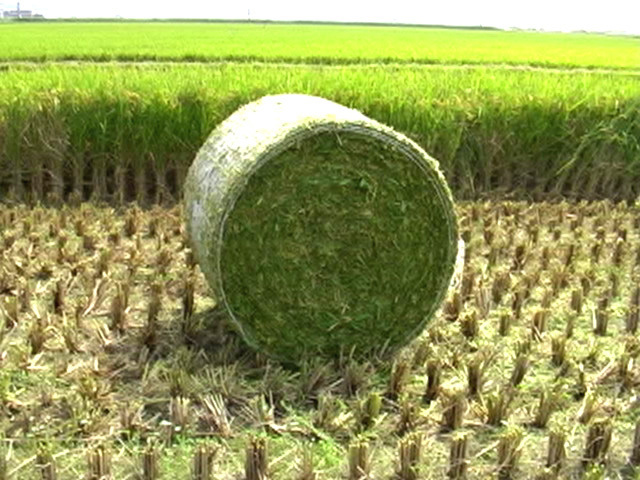 Cut the harvested product to the ideal cutting length of 3 cm and finish it as a rice fermentation rough feed promoting good quality lactic acid fermentation. Maximum output 75PS, equipped with a diesel engine that meets the 2014 exhaust gas regulation standards. In the automatic mowing height control mode, it prevents the tip of the divider from penetrating, it can eliminate mud contamination due to missing of stock and produce high quality feed. It is possible to keep the car body horizontal at front, back, left and right and demonstrate its power to wetland work with wide crawler. Equipped with a 100 liter fuel tank in response to long working hours.